Luang Prabang is a town situated in northern Laos at the confluence of the Nam Khan and Mekong River, was once the ancient royal capital and the center of Buddhism. It may be a place associated with many legends but most importantly it was the birthplace of countless Lao rituals and the origin of a line of rulers. Its wealth and influence were related to its strategic location on the Silk Route. Luang Prabang takes its name from a statue of Buddha, the Prabang, offered by Cambodia. Now, the name conjures up the classic image of Laos. Luang Prabang is easily identified due to its richness in architectural and artistic heritage. Luang Prabang is endowed with a legacy of ancient red-roofed temples and French-Indochinese architecture. Most of the buildings here are remarkably well preserved and is a living museum. It was declared a UNESCO World Heritage Site in 1995 for its unspoiled nature, limestone formations and countless ancient temples. 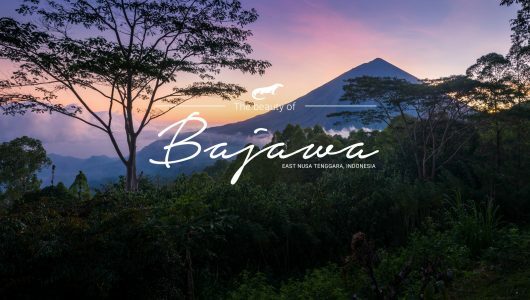 It boasts impressive mountains, lush green landscapes, historical architecture and friendly locals. 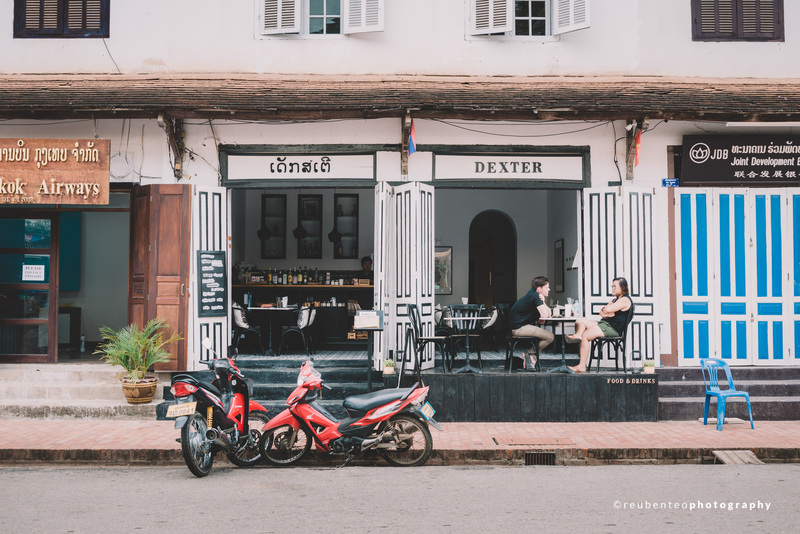 Luang Prabang’s laid back atmosphere and tranquility is what makes it a precious jewel in the heart of Southeast Asia. 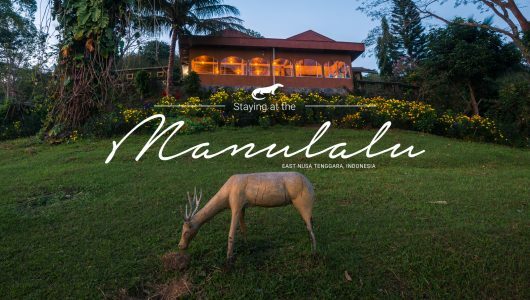 Most travellers spend only a few days here as part of a stop over for a Laos tour. However, Luang Prabang has many things to see, do and eat. It is a destination fit for the leisure seeking traveller. On the plus side, the town is rather small and easy to explore by foot. We spent 6 days here and it was relaxing trip. We also traveled down to Nong Khiaw town for a night’s stay and that’s another story to tell. When to go to Luang Prabang? 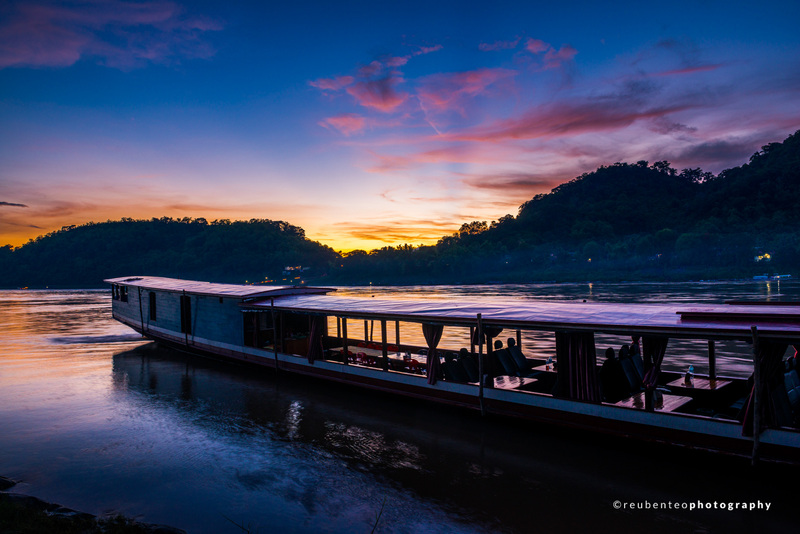 Despite having 2 distinct weather seasons, you can travel in Luang Prabang all year round. Laos has a relatively straight forward weather system as compared with the rest of Southeast Asia. The 2 most important weather conditions that you must be aware of are the dry season (November to May) and wet season (May to October). However, there are some variations in temperatures in different months. Here’s a small breakdown. November to January (Peak Season): Most people visit Luang Prabang during this time when the temperature is most pleasant. This however has some set backs, such as more expensive hotel rooms and places of interest can get pretty crowded. Make sure you make your reservations for accomodations earlier if you plan to visit during this time. March to May (Dry Off Season): Temperature during this period can climb as high as 40°C. That can be uncomfortable to walk around town. However, if you do visit during this time, try mid-April because it’s likely that you will encounter some celebrations and festivities associated with the Laos New Year. This includes the tradition of throwing water. June to July (Wet Off Season): Rainy season in Luang Prabang is in fact a surprisingly good time to visit. That’s the time we decided to visit as well. There may be showers but they are short lived leaving room for plenty of sunshine. Luang Prabang offers dramatic sunsets during these times. Often the showers occur in the afternoon or late at night. The temperatures are cooler and much more comfortable to walk around. August to September (Wetest Season): This is rainest months to travel to Luang Prabang. The Mekong river can sometimes experience flooding. On the bright side, September allows visitors to enjoy the dragon boat race on the Nam Khan River. The race brings competitors from the villages and it can be extremely enjoyable. Luang Prabang is easy to get to. They have a newly rennovated airport which welcomes flights from many Southeast Asian countries. Airasia offers direct flights to Luang Prabang from Kuala Lumpur. Airfares are reasonable and tourists prefer this route. It’s fast and much more convenient. Other airlines offer flights to Luang Prabang as well such as Thai Airways, Bangkok Airways, Laos Airlines and more. However, Malaysia Airlines does not offer direct flights there but you can stop by Vientiane and take a bus down to Luang Prabang. If you take the bus option, it’s best to travel there during the dry season as the roads can get really bumpy and slippery. Malaysians do not require any visas to enter Laos. However, depending on your nationality visa-on-arrival is available at the airport. Prices varies based upon your nationality with most priced at USD35. Airport transfers are relatively simple upon arrival. There is a taxi stand at the airport exit. The price of a transfer is 50,000kip for 1-3 persons. This means whether you’re traveling alone or more, this fare goes up to 3 persons. If you’re lucky, you may be able to find someone to share the fare with you. Getting the hotel to give you a ride is also a good option as hotel vans are usually more comfortable as well but it may be slightly more expensive. 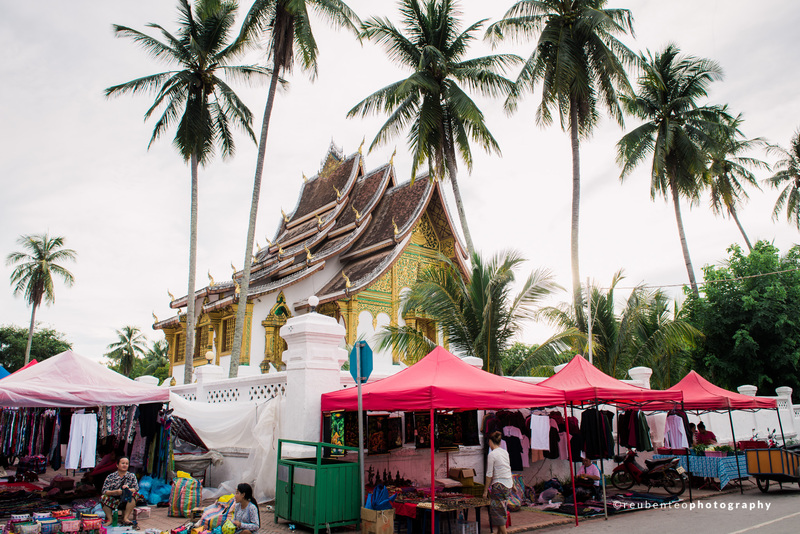 Once you enter the town center, you will notice that Luang Prabang is a quiet and small city. Getting around town is extremely easy as long as you are willing to walk. Most places of interest located in the city center are within walking distance. Many hotels also provide free bicycle rentals. You can just grab a bike and cycle your way around the lovely city. Tuk-tuks are also everywhere in Luang Prabang. They aren’t as intimidating as the ones you find in Bali. They are much more friendlier and mean no harm. If you do not want a ride, just smile and refuse politely. Tuk-tuks are required if you are tired from a long walk especially during a hot day. Tours aren’t necessarily required when visiting Luang Prabang. Most information can be found online or you can ask your hotel front desk. They are always happy to help you out. We traveled on our own without any guides and it was pleasant. We had the time to ourselves and it was much more relaxing too. A good research on places of interest and things to do can give you a Luang Prabang experience of a lifetime. There are plenty of hotels located in town. Due to its small area, choosing the best located hotel isn’t so much of a hassle. There is something to suit every budget, ranging from cheap dorm rooms to luxury hotels. However please bear in mind that because it’s a UNESCO heritage site, hotels within the town viscinity are not allowed to have pools. If you prefer to enjoy a nice dip, then you might want to stay slightly further away from the town center. Most accomodations offer free Wi-Fi, even for budget guesthouses. We stayed at the Apsara Hotel. 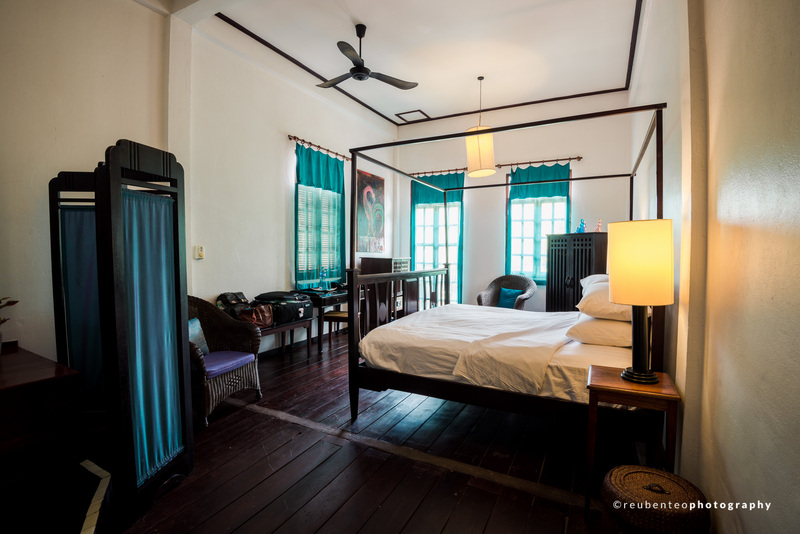 It’s a an upscale boutique hotel in a gorgeously restored school building situated just by the Nam Khan river. We chose this because it’s located at a quiter side of town and it’s slightly further away from the lively night market. It offers extremely comfortable rooms and welcoming staff. Rooms are well lit with natural light and make sure you get the rooms on the 1st floor. Delightful breakfasts were provided daily and there are options to choose from. It’s a great place to stay and relax. There may not be any McDonald’s but if you’re walking in the town center, cafes and restaurants can be found everywhere you turn. Popular food options include traditional Lao dishes and expensive French cuisines. There are also baguettes everywhere. I suspect this is due to their French influence. If you’re looking for cheap food, head down to the end of thenight market street where you will find an alleyway filled with tons of delicious Lao street food. Street food in Luang Prabang is definitely a highlight. The best place to find it is tucked away in an alleyway at the end of the night market. This food street comes to life every night. There are rows and rows of vendors selling baguettes, BBQ, Lao buffet, Lao coffee, fruits and more. 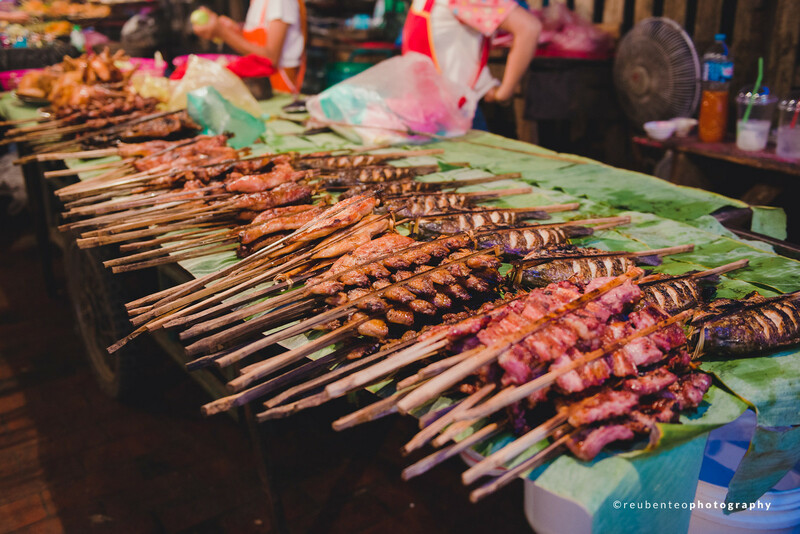 The street is well known for its enourmous variety of skewered meat. 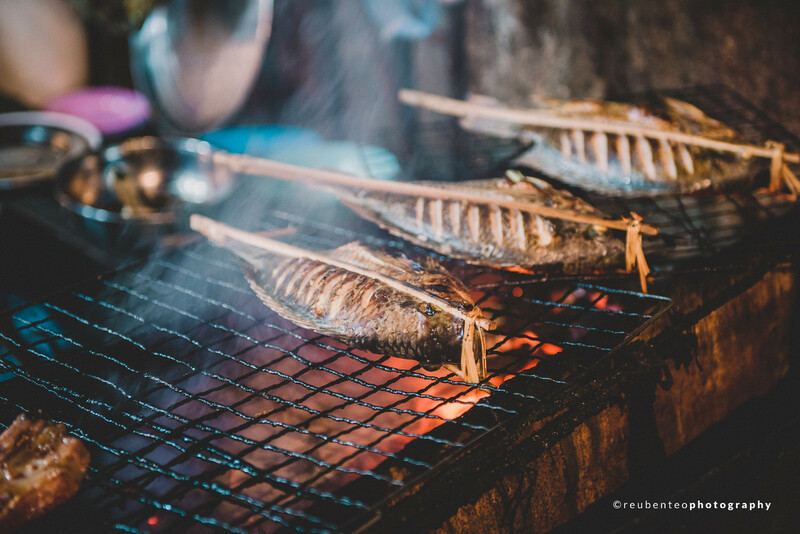 One of my favourites were the skewers of grilled river fish. They were extremely fresh and tender. Marinated perfectly and stuffed with lemongrass, the flavour of the fish is absolutely mouth watering. These BBQ fish was the highlight of my trip. It cost only 20,000kip and was so addictive I had to go back for one more before heading home. These little balls are called Khao Nom Kok. 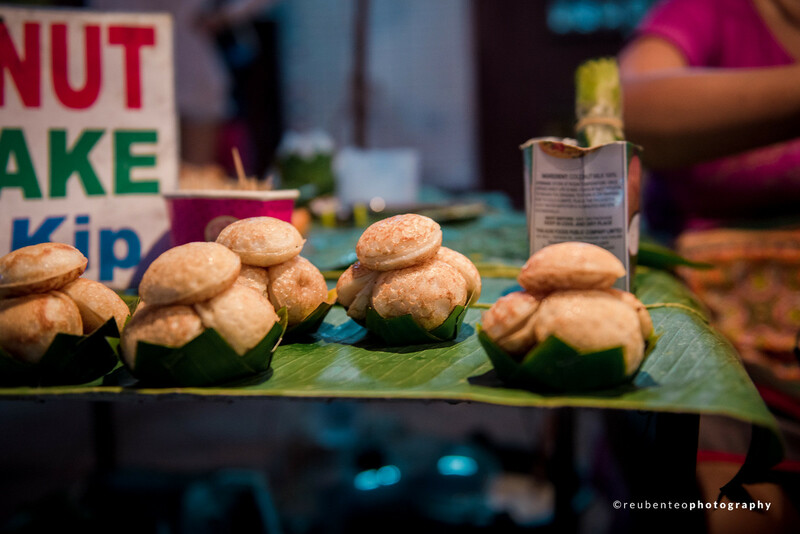 They are a type of coconut pancakes found on the streets of Luang Prabang. They are balls made from glutinous rice, coconut milk, sugar and flour. It’s usually fried in a cast iron-pan just like the japanese takoyaki. Unlike most kuih found in Malaysia, these little pancakes are much more mushier in texture. It’s worth a try as it costs only 5,000kip per pack. Take a stroll down the riverfront of the Mekong River during the late evenings and you will discover there are hundreds of table and chairs being set up. These are restaurants that offer a gorgeous view of the Mekong River. 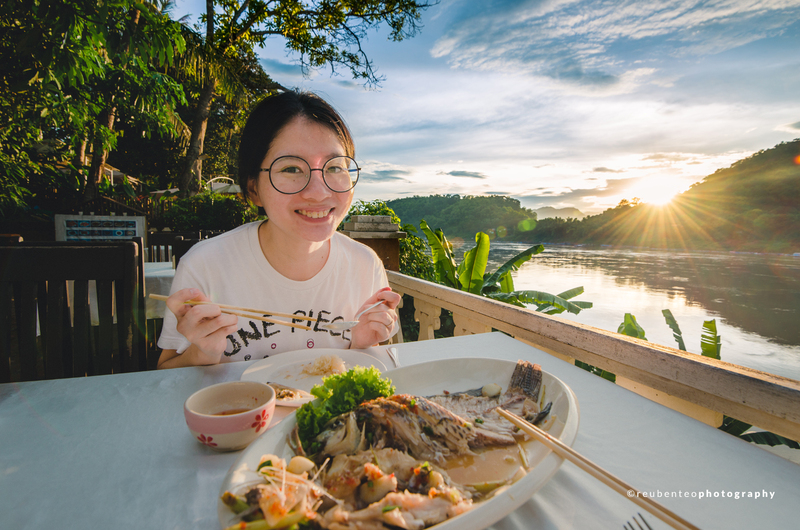 You get to enjoy good local food with a sunset view. There are many restaurants to choose from. A good search on the internet and you will find many restaurants that caters for any budget. We decided to just take a stroll and check out one with a good view, it was part of the experience. Despite being slightly more expensive, the food was tasty and satisfying but best of all the view was fantastic. We had grilled fish, spring rolls and even tried their spicy soup. Anything off the menu is guaranteed a satisfied meal. Don’t worry about what to order because their menus come in English and either has pictures or good descriptions of the ingredients. Baguettes are served every morning for breakfast in our hotel but that doesn’t mean Luang Prabang only offers them. 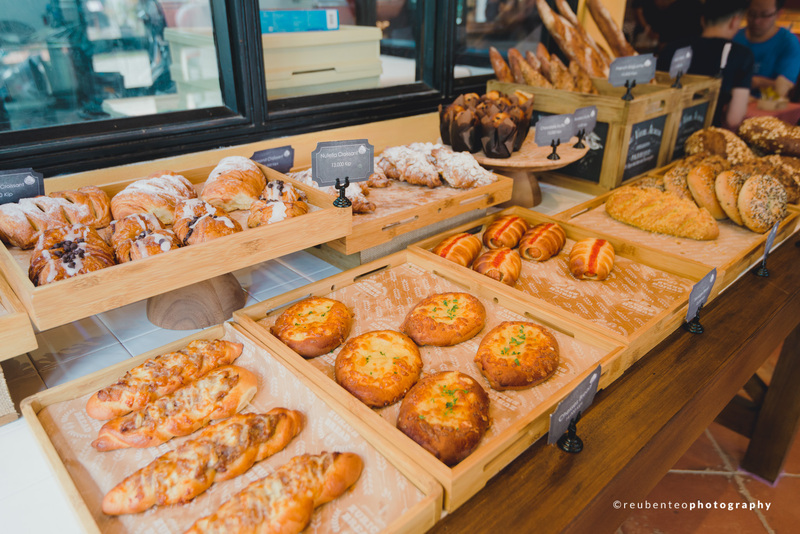 Bakeries can be found just around the streets and they serve a variety of breads and pastries. They may not be particularly French but you still can get your dose of croissants and baguettes. These bakeries serve quality breads and pastries. Most of them offer cafe-like environments for you to sit down and enjoy a cup of Western coffee. It’s the closest thing you can get to being in France without spending Euros. It’s also a good place to strike a balance from too much Lao food. 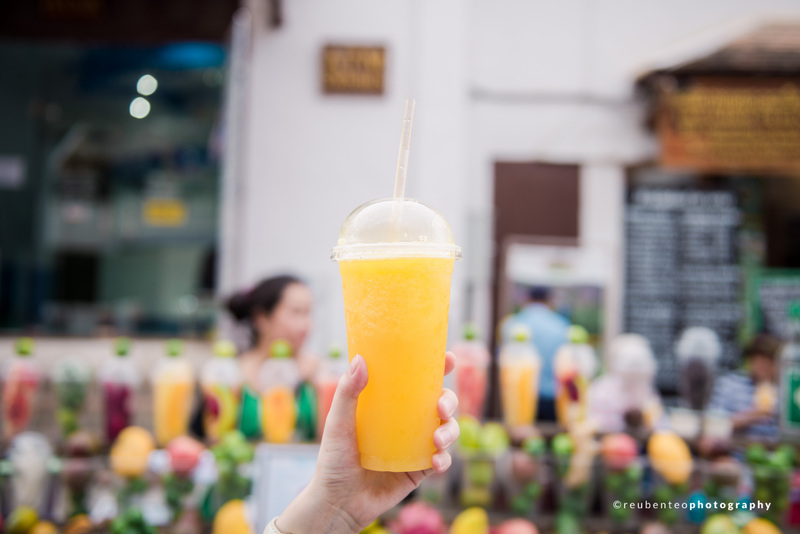 Fresh juice can be found around Luang Prabang. The fruit juice stalls are very unique and easily identifiable in Luang Prabang. The stalls are decorated with plastic cups topped with a variety of fruits and fruit combinations. All you have to do is pick any combination or fuits of your choice and the vendor will have them squeezed. It’s cold and goes extremely well on a hot day. Juices cost only 10,000kip each and keeps you refreshed and hydrated. There are many things to do and see in the undiscovered little town of Luang Prabang. It offers an array of food, culture and nature. There are 34 UNESCO protected temples located in this very town but that doesn’t mean you have to visit all of them. However, there are a few that you must visit in order to make your Luang Prabang trip more complete. 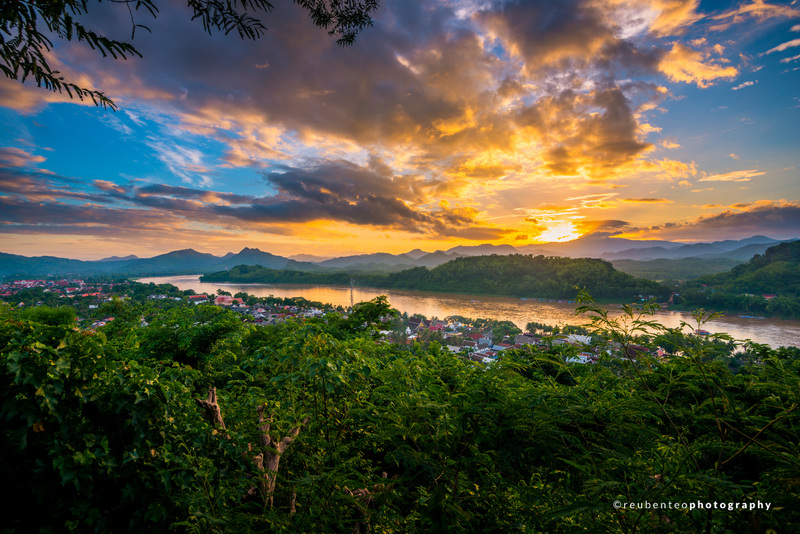 Besides temples, Luang Prabang offers beautiful landscapes and nature. Below are a list of sights that you shouldn’t miss. The oldest temple in Luang Prabang and also the most gorgeous. Wat Xieng Thong is known as “The Temple of the Golden City” in English. It symbolises Laotian traditional art, culture, religion and royalty. Rich in historical and cultural importance, the temple architecture is an elegant piece of work and intricate artwork decorates the both the interior and exterior of the entire temple. The compound comprises of over 20 structures including shrines, pavilions and even residences. A royal funerary carriage house called the Chapel of the Funeral Chariot is located at the west side. It houses the funeral chariot of King Sisavangvong that is covered with elaborated carvings and gilded decorations. It also houses urns for the rest of the royal family members. Little details and surprises can be found around the temple compound, you just have to take some time to appreciate and look carefully. Entrance fee to the temple is 20,000kip. The Royal Palace was built in 1904 during the colonial era for King Sisavang Vong. In 1975, communist forces overthew the monarchy and the palace was then converted into a national museum where it was preserved and laid in its exact same state. The architecture of the building is a mixture of Lao and French styles. Visitors are able to walk through the corridors and catch a glimpse of how the King and his family once lived. Inside the palace, visitors can also see the gorgeous throne room and the crown jewels. All bags and cameras must be stored in lockers when touring the palace building. It is advisable to dress respectably. A fee of 20,000kip is required when entering the palace grounds which includes the fare into the Haw Pha Bang royal temple located beside the palace. 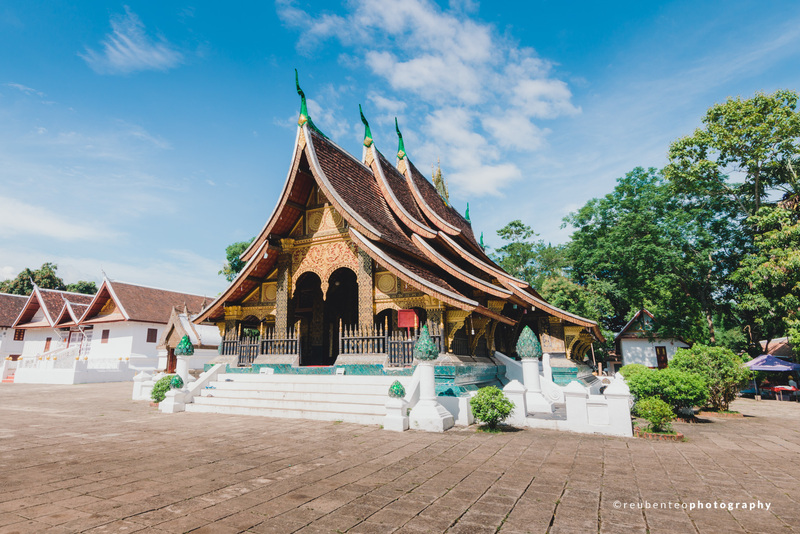 The Haw Pha Bang is also an iconic structure that can be seen when you walk the streets of Luang Prabang town. 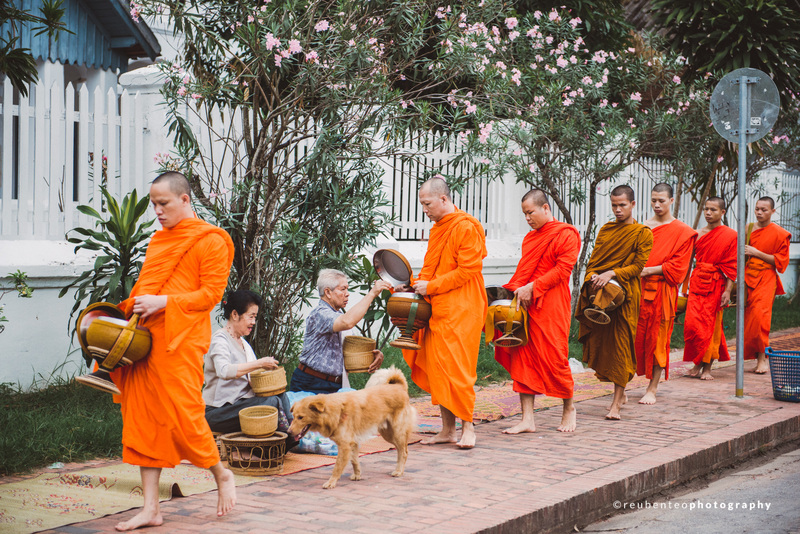 As dawn breaks around 5:30am, saffron-clad monks line up along the streets of Luang Prabang for the alms giving ceremony. There has been controversy stirring around the authencity of this ceremony, but nevertheless it’s quite a sight to experience. 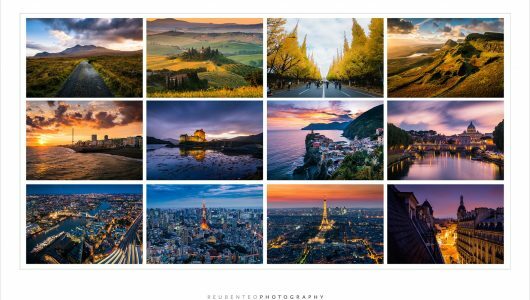 Whether you would like to participate or just there for some photo opportunities, there are some simple rules to adhere before heading there. The most important would be dressing up respectfully. 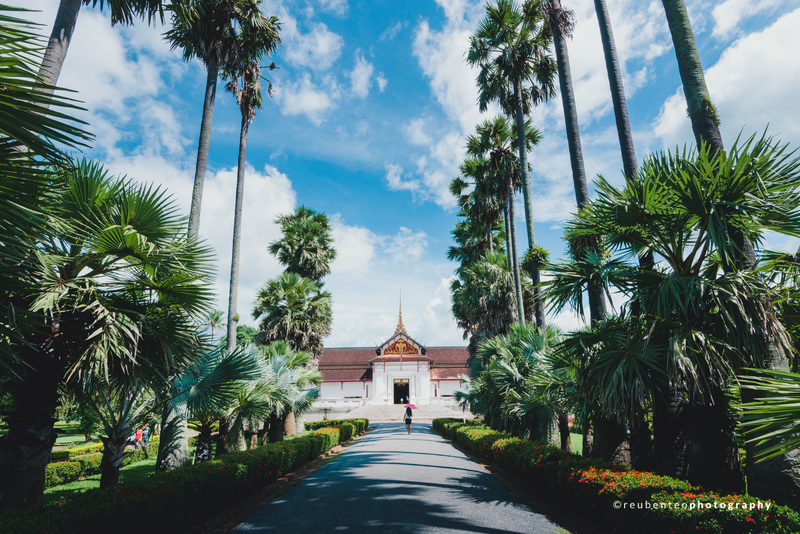 As a frequent Southeast Asian traveler, most would know that covering your knees and shoulders are important when visiting religious sites, the rules are the same during the Tak Bat. When taking photographs, avoid using any flash at all. Last but not least, if you would like to participate, get your hotel to arrange everything for you. Do not buy anything from the vendors at the streets because there are said to be scams where bad rice has been sold to tourists and given to monks which caused them to be sick. Be smart. 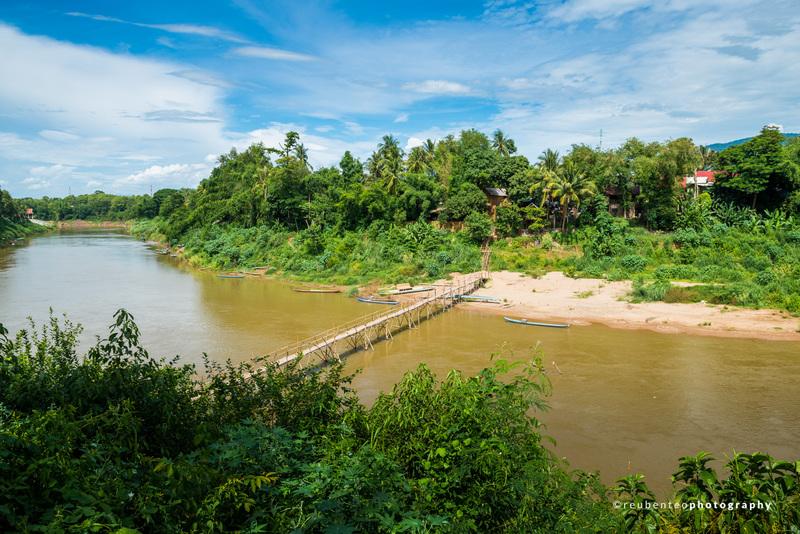 The Bamboo Bridge at the Nam Khan river is an interesting place to visit. You can only see the bridge during dry seasons. During rainy seasons, the bridge gets washed away by the high tide of the river. By crossing the bridge, you can access the opposite village and a few popular restaurants. Pizza Phan Luang is famous amongst foreigners and is a good place to enjoy a pizza which is located at the opposite side. You can also visit the Mekong Sunset Beach Bar which offers a great place to enjoy the sunset while having a drink. A small fee of 5,000kip is required to cross the bridge, which in return is to fund the family that builds and takes care of the bridge. 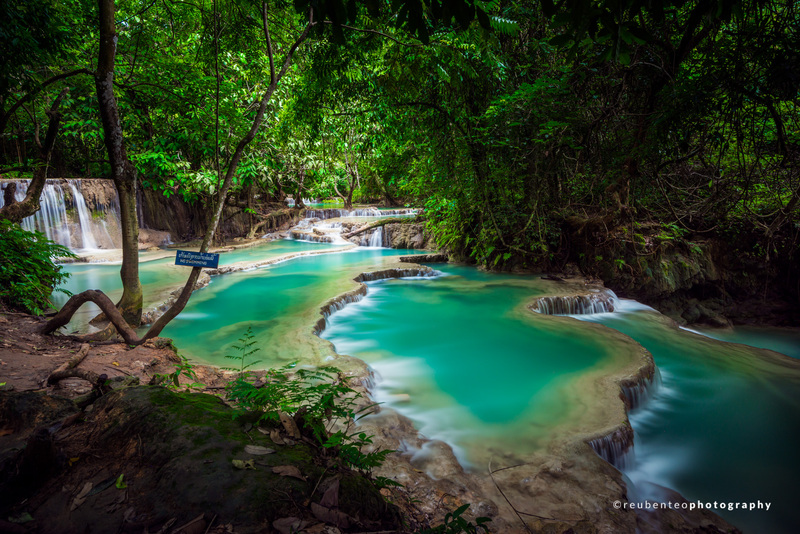 Located 30km off Luang Prabang, the Kuang Si Waterfalls is the most popular amongst locals and foreigners. The falls are indeed magical due to its lovely natrual turquoise colours. The water from the falls are cooling and extremely refreshing. Most people come here during the weekends to take a swim. The waterfalls has many sections and only parts of it is off limits to swim in. There is a large waterfall at the end of the trail and it is one of the most beautiful things I’ve ever seen in my life. Getting to the falls is fairly easy. 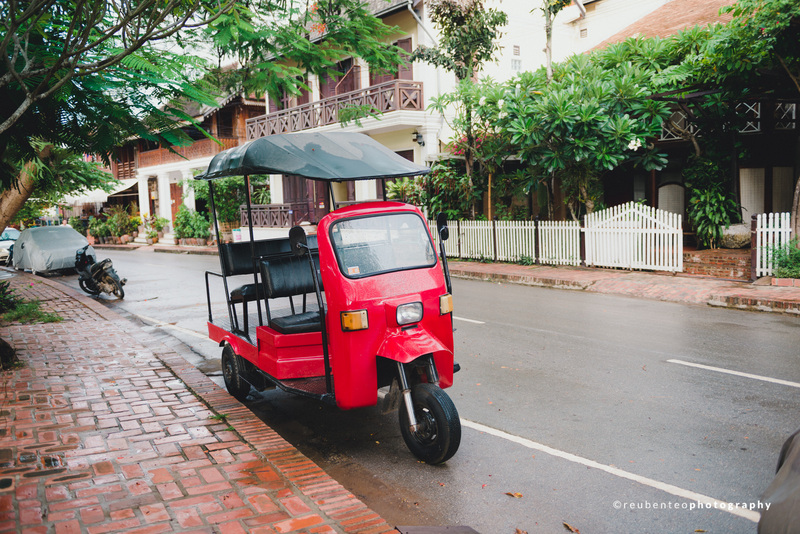 All you have to do is go into town and hail a tuk-tuk. Pricing varies and it depends on your negotiation skills. We paid 200,000 kip for an entire tuk-tuk and it was a return trip. The ride was a little bumpy but the view was spectacular. If you’d like to save on the cost, try looking for other tourists to share the fare. It’s really easy to find someone on the streets who’s willing to share the fare as the waterfalls is a must see when visiting Luang Prabang. Entrance fee into Kuang Si is 20,000 kip per person. Click here to read more. When you’re feeling a little lazy, don’t worry about it. 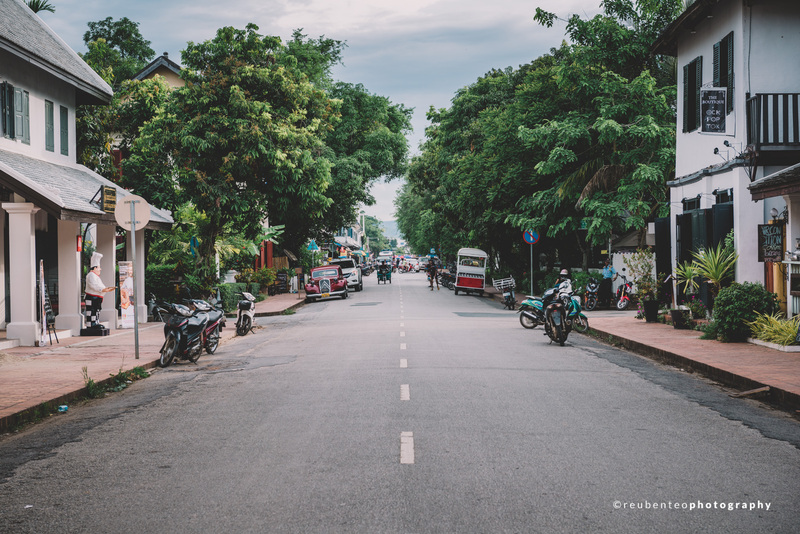 A stroll along the streets of Luang Prabang is a sight on its own. The UNESCO town earns its name from its well preserved temples and colonial buildings. Along the streets, you’ll find surprises within the shoplots. There are local puppetiers, western cafes, local artist galleries, massage parlours, bakeries, and many more. The peceful town makes strolling a wonderful experience. With its lack of vehicles, you get to see more of the town without worrying about crossing roads. The best time to take a stroll would definitely in the late evenings when the weather is cooler and the light is softer. A romantic atmosphere emerges as the sun begins to set. After a nice walk around town, why not head to a local coffeeshop for a cup of coffee? Getting a seat at a cafe makes you feel exactly like in Paris but with tropical weather. It’s a great place to hang out and chill for the afternoon. Sometimes, the weather can get a little bit too hot, so take a break at the cafe to ease off the heat. Afterall, wasting time doing nothing in Luang Prabang is a fantastic way to enjoy it. The night market opens daily and mainly caters for the foreign crowd. Located right outside the Royal Palace Museum, there are many things to see and buy. You can get your dose of cheap souvenirs here and a great place to test your bargaining skills. 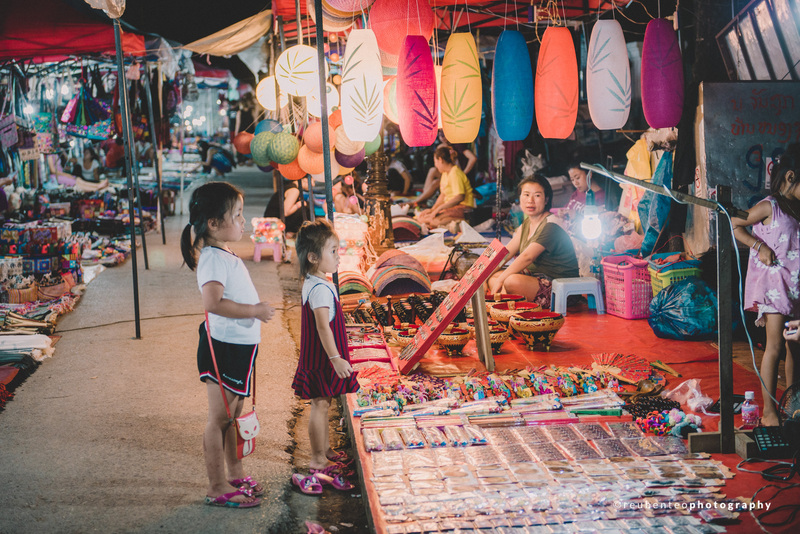 The vendors here are generally much friendlier and less pushier compared to other parts of Southeast Asia, but this does not mean you should get too obssessed with your bargaining skills. They are mild and relatively more polite which makes it comfortable to browse around in peace and quiet. It’s a great place to shop for cheap goods but please be aware that it closes at 10pm. My favourite part of the night market was the food street located at the end of the market as mentioned above. Filled with tons of street food, that’s the place where the real experience of Luang Prabang comes to life. Don’t forget to grab a large container of mangoes for only 10,000kip. The mighty Mekong River plays an important role in Southeast Asian culture. Rich in history, it’s only fair to enjoy it by taking a boat ride along the river. The Mekong River has a gorgeous romantic atmosphere especially when the sun starts to set. The quiet ambience and the soft sound of the boat’s motor allows anyone on the Mekong River to relax their minds and forget their worries. There are many boat companies that offer sunset cruises on the Mekong River. A search on the internet and you will find yourself a few options to choose from. Local travel agencies in Luang Prabang can also help to arrange these lovely romantic cruises. Climbing up to Mount Phousi is a must do when visiting Luang Prabang. Situated right in the center of town, it is easily accessible by foot. There are many entrances to access Mount Phousi but the easiest to find is situated just opposite the Royal Palace Museum. Mount Phousi is a sacred site for Laotians, therefore dressing appropriately is important and a form of respect. There is a temple called Wat Chom Si at the peak which was built in 1804. Nevertheless, the peak offers one of the best vantage points of the entire town of Luang Prabang. 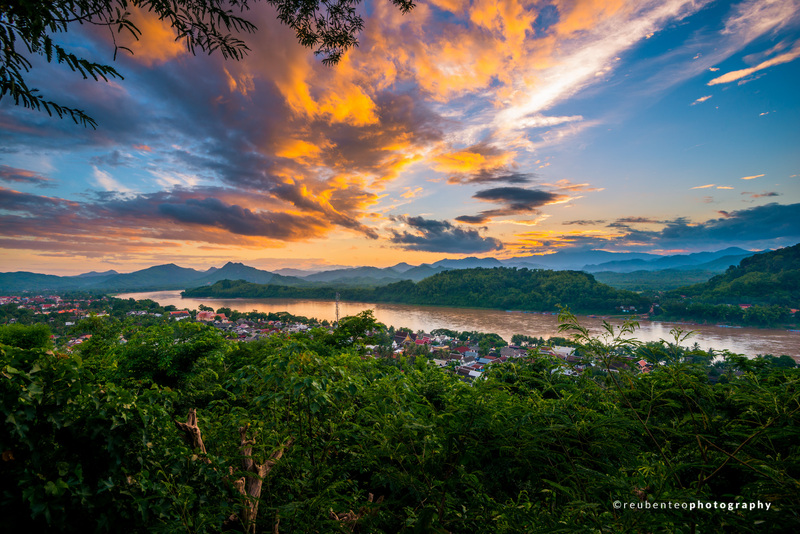 Most of the foreigners climb Mount Phousi in the late evenings to catch a glimpse of the sunset by the Mekong River. Be careful because it may get really crowded in the evenings. Entrance fee to Mount Phousi is 20,000kip. Click here to read more. Don’t be discouraged by the hot weather of Luang Prabang. With its tranquil and relaxing atmosphere, hop on the next flight and spend a few days at this gorgeous little town. See for youself how beautiful this undiscovered Southeast Asian city is. Malaysians don’t require a visa to visit and you don’t even need to pack a lot of things. So, why wait?